My studio is surrounded by woods, up from the blueberry barrens, five miles from Penobscot Bay. The studio windows face south looking out on our gardens. In winter it is all white fields and dark bare woods. In summer it is a riot of colors from the flower beds and vegetable gardens backed up by the deep green of the surrounding woods. Always the colors inspire. 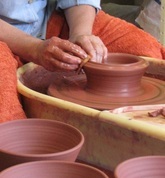 My pottery is made from a very rich earth red stoneware clay. Wet it is very reminiscent of the red clays of Georgia where I grew up. Fired it is an iron red background to my glazes. My clay and glazes are made from non-toxic materials. All of my pottery is fired to a durable stoneware temperature of approximately 2232 degree F in an electric kiln. Stoneware pottery is suitable for oven and microwave use and is dishwasher safe. However, it should never be placed directly on a stove top or subjected to sudden extreme temperature changes such as refrigerator or freezer to a hot oven. 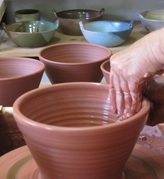 All of my glazes have been carefully formulated for durability and beauty. My palette of earth tones has evolved as I have lived and worked in different places and absorbed the colors that surrounded me. The sand and rust red are reminders of the desert. The blue and turquoise are remnants of my time in the Middle East. The greens and deep blue-greens have been assimilated during the "non-white" months up here in Maine. I am a colorist at heart and strive to create glazes that work together. 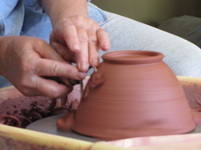 Every piece of pottery is handcrafted and wheel thrown. Although I work in series and often repeat shapes, each piece is individual. Slight variations in firing temperature and glaze thickness create pieces that are each unique. My galleries represent just a portion of what is in production at any time. Please feel free to call or email me if you have a special order or any questions or comments.